Discussion in 'Calibration, Help, and Troubleshooting' started by Kick2box, Mar 15, 2016. As some of you also don't work with S3D, I'll post my current slic3r-profile with toolchange gcode. For me purging with 10/-5 works fine, with more retract I had my hotends jamming from time to time. Just printing the 2-colour-treefrog and it's looking nice (oozeless). Remove .txt, I just could not upload with extension .ini. Looking forward to seeing the frog, and how much wastage you get! Still almost 2 hours to go, I will send a pic tomorrow. Won't be too much waste, just about 4-5m of molten filament. This is the frog with all the waste. It suffers from underextrusion of silver filament. I've found that you really need to adjust the E-steps for each extruder, I've a difference there though. And the frog should be printed with smaller layers, this was with 0.25mm. I attached my changes to the settings. does someone have any video of the dual using the dump box, just curious thats all I know its not too exciting. It's really a waste of time, but it helps a lot! You won't stop oozing of the second nozzle in another way, and wipe towers are even more time consuming. 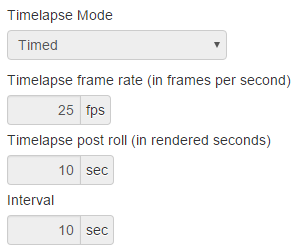 What timelapse settings are you using @Spoon Unit, is it on timer rather than z-change? Mine always come out too fast. @PsyVision. I still think these are a bit too fast. Certainly too fast to debug. Also, I think I'm on the stock 5000 bit rate. Being trying to put some more fun stuff in config.yaml but so far, I keep killing Octoprint, so I keep reverting to the original. I ought to at least bump up to test it. I really want to get the focus sorted on the PiCamera too.